A spokesman for Police Scotland, said: "We will not disclose the full range of speeds, however a number of offences were over 30mph and a minority were recorded in excess of 40mph." He added: "The high number of offences is somewhat disappointing, as we published our enforcement intentions. The results reinforce the local community, community council and councils' concerns." However, a spokesman for IAM RoadSmart (formerly the Institute of Advanced Motorists) said: "They highlight the complete failure of the blanket 20mph speed limit approach to remind drivers a road that does not look unsafe is still covered by a 20mph speed limit. Ocean Drive looks and feels like a wide, free-running road with relatively few pedestrian crossing away from junctions. Police Scotland risk losing public support for 20mph by choosing to enforce on such roads." He argued that: "It would make far more sense to be enforcing outside schools or in densely packed residential areas with parked cars masking child pedestrians." 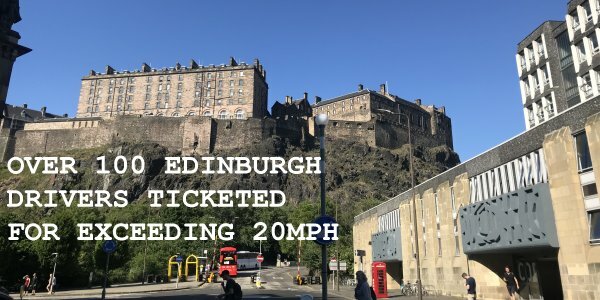 The Edinburgh City Council Transport Convener commented: "Initial monitoring shows that speeds are dropping across the city, which is extremely encouraging – a drop in average speed of just 1mph can result in a 6 per cent reduction in casualties."